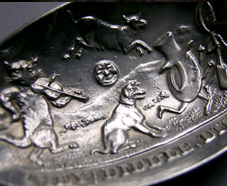 Silver has been considered for centuries the perfect choice for wedding and christening gifts, providing pieces which were both beautiful and useful; a deeply personal gift, long-remembered. 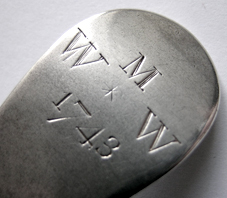 In the seventeenth century a simple, single, hand-wrought and inscribed spoon for a christening gift might provide a lifetime’s service to its owner, whilst in the eighteenth century a marriage could result in an order for a service of table silver, tureens, candlesticks, salvers, wine coolers, cisterns and the vital service of flatware with serving pieces, often amounting to 3,000 ounces or more! From an Edwardian novelty spoon, to elaborate Victorian christening sets, mugs and elegant, affordable, single Georgian spoons, we are happy to suggest the perfect item for that special christening or wedding gift. Please contact us below.